Internal conflicts have reached to top level in the CPM party. 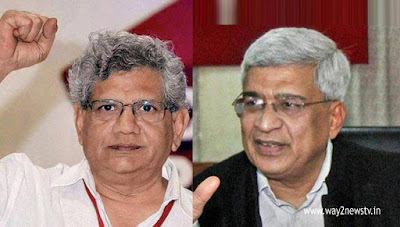 The Party Central Committee has stopped Sitaram Yechury to introduction of political draft resolution.The political draft resolution notification was introduced by Former general secretary and senior leader Prakash Karat not by the general secretary in the mahasabha . Political draft resolution is very crucial which is accepted during the party mahasabha.The draft will play a crucial role in the political policy of the party in the next three years. If it is approved, the party function is cruel. This political decision takes priority in the most crucial draft papers in the party congress. Every time the party general secretary submits it. This time, however, the Congress did not allow the general secretary to submit it. Party sources have confirmed that this has never happened before. It was the first time that other than the general secretary introduced this. In the next Lok Sabha election, the political strategy that the party follows will be the main point of the political framework. Would the CPM hands with the Congress and other democratic secular parties to effectively counter the BJP? Do not you? This topic is mentioned in the political resolution. But the Karat faction of the party argues that there should be no alliance with the Congress. But there is a belief that anybody can work with all the secular forces in accordance with changing circumstances, and then the BJP will be courageous. Yechury's supporters believe that the CPI (M) leadership in the recent assembly elections in Tripura has to be cautious in the wake of the Left Front faction. But the Karat group has revealed that it is saasemira. It was reported that the West Bengal delegation had protested over the failure of the general secretary to accept the political framework. The CPI (M) leader did not mention the name of the party that the group of extremists led by Karat had no intention to go ahead with Congress to join the Congress. However, if it is approved for a particular stance on the party code of conduct, there is no need to resign as a liability for the failure of a person who has taken the position. But the defeat of his policy is really a moral defeat for him, another spokesman said. The situation is likely to lead to the fact that the person is not in party leadership. On Wednesday, the unprecedented decision on the draft resolution on the draft resolution introduced by the former leader rather than the general secretary of the party would reach the voting stage. But what is the effect of the resolution in the Conference as it is the curve of any kind of caricature and the tendency to win their arguments? Where does the result go It is not clear. However, a party leader said there would be a middle way for the parties to compromise despite the various persistent arguments. The draft political resolution will be held on Thursday for the five-day party meeting. It is crucial that any debate in voting will come. The party general secretary Sitaram Yechury on Wednesday said that the decision was taken by the party's central committee meeting last month.